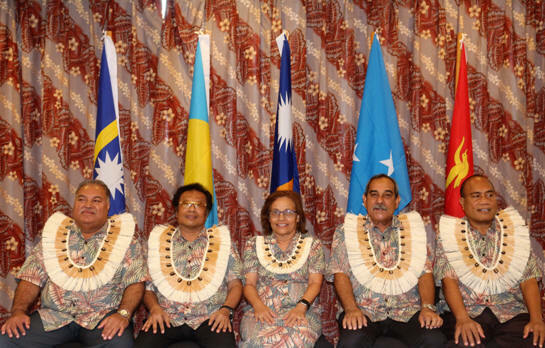 Palikir, Pohnpei (Department of Foreign Affairs): On December 9, 2016, a signing of a handover certificate took place at the President’s conference room between Secretary of Foreign Affairs of the FSM, T.H. Lorin Robert and H.E. Li Jie of the Embassy of the People’s Republic of China. The monetary assistance of $800,000 will be used to subsidize the newly launched Air Niuguni that provides service between Papua New Guinea and FSM. In a short remark, Ambassador Li Jie stated that the Chinese Government is happy to assist the FSM in its transportation development efforts. He further stated that the assistance will not only improve FSM’s transportation development but will certainly contribute to the FSM’s economy and nation building effort. Secretary Lorin Robert reciprocated the remark by thanking Ambassador Li and the Chinese Government on behalf of President Christian and Vice President George for the generous assistance. He concluded by assuring Ambassador Li that the assistance will be put to its intended purposes and that it will certainly enhance the good working relations between FSM and China. For further information on this release, please contact the Department of Foreign Affairs, APAMA Division at 320-2613.